These mini cheesecakes can be topped with everything from strawberries, blueberries, and cherries to chocolate sauce and caramel. You can use either fresh fruit or canned pie filling. My personal favorites are blueberry and strawberry. If I buy strawberry pie filling I’ll often add fresh chopped strawberries to it too! They’re easy and so delicious!! Cheesecake is one of my all time favorites and baby bite sized cheesecakes are the perfect dessert to bring along to any party! Preheat oven to 350 degrees. Line a mini muffin pan with 18 liners. Crush cookies until you have 1/3 cup crumbs. Add melted butter & mix well. Place 1 teaspoon in each cup and press down. In a medium bowl combine cream cheese, powdered sugar, lemon juice, almond extract and egg. Beat on medium speed until light and fluffy. Place cream cheese mixture in a Ziploc bag and snip off the corner. Evenly fill each well. Bake 15 minutes or until set. Remove from oven, cool completely and top with desired toppings. 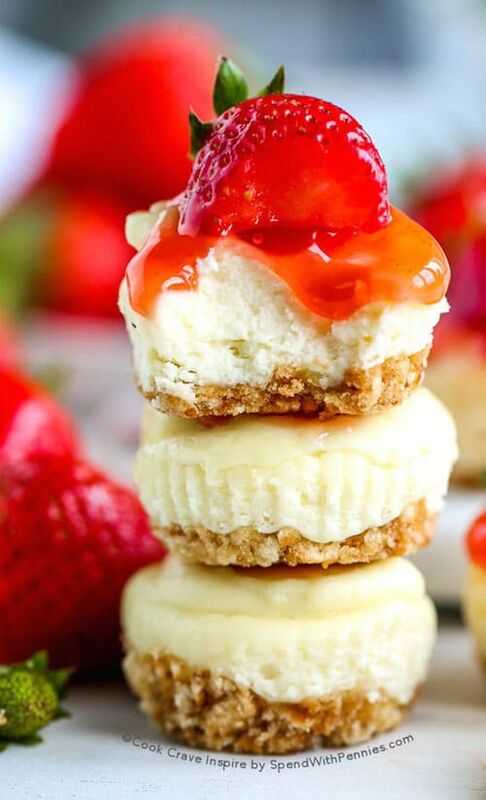 0 Response to "Mini Cheesecakes are these perfect bite"